If a golden glow is what you’re after- Beautyologist is here to help! In fact, at Beautyologist, we’re so passionate about pursing that great golden glow that we created a spray tan formula all our own! 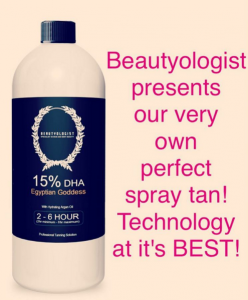 Beautyologist’s very own spray tan 2 hour liquid is packed with natural ingredients, available in 3 different shades. It contains no alcohol, no parabens, and no orange pigment! Fast drying formula with hydrating Argan oil provides a longer lasting tan! We recommend you wear loose clothing to your appointment. For best results, please exfoliate before you arrive and have no alcohol or cream on your skin. The more you moisturise after your spray tan treatment, the longer it will last. Try our superb, deeply hydrating dry body oils to keep you skin nourished after the tan!